Interesting. You are nearly guaranteed seeing whales in Simon’s Town. You may not see Killer whales in Simon’s Town because they are irregular visitors. But you will see whales. Just yesterday Dave saw this lone dolphin among the Southern Right whales in False Bay. How close can you get to dolphins and whales in Simon’s Town? You can see whales in Simon’s Town False bay in July, August, September, October and November. Southern Rights peak in October. In other months you may also see whales in and around Simon’s Town but you’ll need to make some effort – like getting on a licensed whale watcher’s boat. But they are scares the. I’ll get to that. Let’s say you are in Cape Town; to increase your chances of seeing whales you need to phone on the day of your planned trip and ask if there were any whales spotted during the morning, the day etc of your trip. (Call me at 021 786 4028). If there were no sightings then you may still see whales later in the day. But call first. If you are lucky you’ll see whales on your way to Simon’s Town. Along the road past Kalk Bay, Fish Hoek onto Simon’ Town. Even taking a trip from Cape Town, Muizenberg, Simon’s Town, Cape Point, Kommetjie, Hout Bay can yield some great sightings. Between Scarborough and Kommetjie is a place called Misty Cliffs….this is a great spot at a nice vantage point to see whales. The best bet is to get on a boat and see the whales. When you arrange a whale boat watching trip in False Bay you have nearly a hundred percent chance of seeing many whales – obviously in the Cape town Whale season. The owner of the boat is a nice guy. And most times when there’s no sightings he’ll give a second chance. Give me a call and let’s arrange it for you. It’s R850 for adults and R500 for kids. Kari took this photo of African Penguins on the Whale Watching Boat. 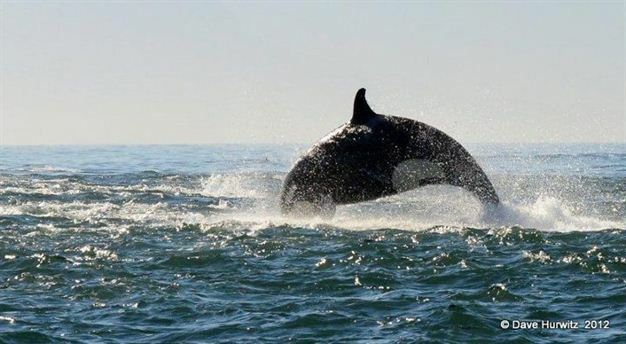 Did you know that people spotted more than 150 whales in False Bay during the 2012 season before the 2 September. These could be the same whales spotted by different people. When I spoke the Dave about spotting whales on the whale watching boat, he said to me that they see between one pod of 5 to 5 pods and in total between 20 and 50 whales in the same day. Amazing! Like I said in a earlier post; you can see whales at Hermanus from a unique vantage point in Hermanus. Watching whales at Simon’s Town however is close to Cape Town. It will take you less than 40 mins. But travelling to Hermanus will take you more than double the time. Watching whales in Simon’s Town or Hermanus; whatever you choose seen it as a lovely holiday road trip. I wrote this post on things you can do the kids in and around Cape town; nature things. And you can do the route as well. Or take the steam train all along the coast to Simon’s Town and watch whales from the windows of the train. If the steam train is not running then opt for the hop on hop off train pass from Cape Town to Simon’s Town and many people see the whales as they travel along. At Simon’s Town you can get on the whale watching boat. What a Cape Town holiday adventure. If I were you I would let Elmarie arrange you lovely holiday accommodation in Simon’s Town. After reading this post on Whale Watching in Hermanus or Simons Town; have you made your choice or do you have more questions? Please share them in the comment area below. Have A Whale Of a Fun Time. P.S. Call Cape Holidays to check if there are whales, where they are along the side of the road and to book your whale watching boat trip in Simon’s Town. Call me now at 021 786 4028 or 021 786 4028.